If you were asked which Surrey swimmer took part in most finals at the LEN European Swimming Championships, you might struggle to answer! In fact, Great Britain didn’t have any elite swimmers from Surrey! But we were delighted to see Godalming Masters’ Sam Chadwick starting the races for the fastest women in Europe, including Olympic champion Ranomi Kromowidjojo, world record holder Sarah Sjostrom, and GB’s own Fran Halsall! Sam qualified as a starter in 2007 doing mainly small club galas and Surrey Age Groups. He then progressed to Regional Championships in 2008 and was offered the British Swimming Development Program assessment, which he passed with flying colours that year at the ASA Masters. This was followed by the British Swimming Starters Program in 2009 during which Sam officiated at two or three national events per year until 2015 when he was nominated on to the FINA list of starters. Sam has continued to do two or three national events a year and this year was invited by British Swimming to apply for the European Championships in London. At national events, there is always a development referee and starter, and a FINA referee and starter. 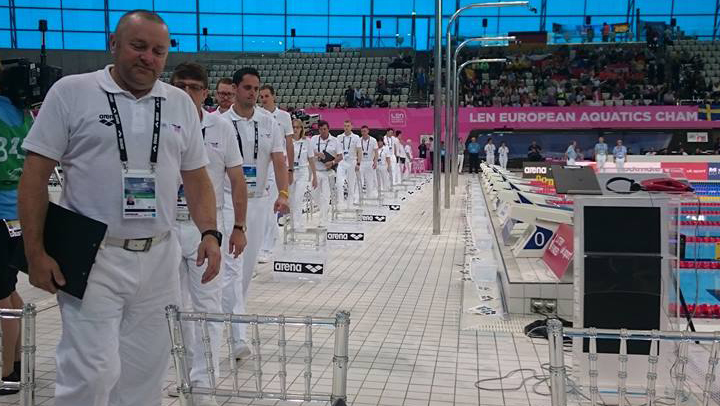 At European events, all officials are FINA referees apart from the referees who are members of the LEN Technical Swimming Committee (TSC) and the starters who will be FINA starters – one from the host nation and one foreign nation starter. With few opportunities available to starters, your first chance may be your only chance, and so you need to get your job right! Sam Chadwick (third from left) walking on at the start of a session. Assuming your performance is good, you will be offered further events. At London, Sam was joined by six other British Swimming referees in the officials team, including one member of the LEN TSC. It is worth noting that your assessment includes how well you work and interact socially with the other officials in the group. If you just stick with officials from your own country, this may be frowned upon – you are there as an international official, not a British one. In the evenings, depending on where the other federations house their officials, you have dinner and socialise with all the other officials. At European events, just as at Nationals, you start either only women’s events or only men’s events for the entire championship. The event starts with an officials’ technical briefing the day before the swimming starts while each session includes pre- and post-session briefings. After the event has finished there is a debrief where certificates and pin badges are handed out to all. Sam said: “It was very stressful for me for the first couple of days but I relaxed into it and let my poolside work do the talking. “If you put out of your mind who you’re starting and what is at stake then it’s no different to a county gala. Click here to find out more about becoming an official on the British Swimming website.